I LOVE Halloween! It is my absolute favorite holiday so our family really gets into it! We go all out with decorations, costumes, parties, treats, etc. Unfortunately all of that “stuff” can mean lots of scary things heading for a landfill! Eeeeeek!!! 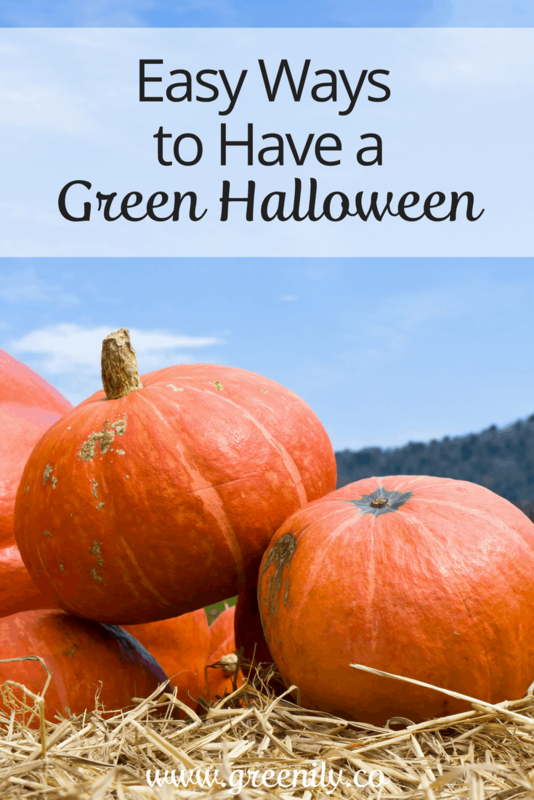 Fear not – there are lots of things you can do to make Halloween a little greener! About two weeks before Halloween we hit the attic and the assembly line of (many) boxes makes its way down. There are skeletons that hang on the porch, small spiders that crawl up the columns, big spiders that threaten from the railings and the spider of all spiders – that only Dad can hang – that stares with her red beady eyes from just above the front steps. I have to admit – I’m tempted to pull everything down from the attic right now and decorate! I can’t wait…but I will! The reason I can rattle off all of the decorations we have is because we have had them for many years. We may add one new thing a year (like the spider projector light my husband surprised me with a few weeks ago – so cool!!) but we REUSE everything. Not only does it keep lots out of the landfill but it’s so fun to revisit it all each year. It gives us a chance to fondly remember past Halloween celebrations, silly costumes we dressed up in and how much fun we had with friends. If we do come across a decoration that the kids deem “too babyish” or not scary enough we are sure to donate it to our elementary school, our old preschool, our Sunday school or a local charity. Try to keep this all in mind when it comes to your Halloween decorations too! Once Halloween is over and you and your family are back to your normal (okay, not dressed up!) selves make sure to hang on to your costumes and accessories. You never know when you’ll get the email from your son’s teacher asking that he come dressed as a pirate TOMORROW to act out a book they are reading in class! If you’re like me you could outfit a small army of kids and adults in a wide variety of looks with the costumes and accessories saved through the years! They come in handy! Speaking of reusing costumes (or parts of them) – a great alternative to purchasing a costume is borrowing from family and friends. Once you make the all-important decision about what you will be, get the word out to see if anyone has items you can borrow to complete the gruesome look you’re going for. You may be pleasantly surprised to find that someone has just the machete dripping with fake blood or Viking helmet you were looking for! Another reuse option is second hand and thrift stores. They can be a great place for clothes, shoes and accessories. When you are done with them be sure to donate them back to the thrift store or another charity. If by chance you altered the clothing (i.e. cut it to shreds for your zombie look) you can still keep it out of the landfill by recycling clothing, shoes and many accessories. It’s not likely they will get picked up with your curbside recycling but you can probably drop them off at your local transfer station. 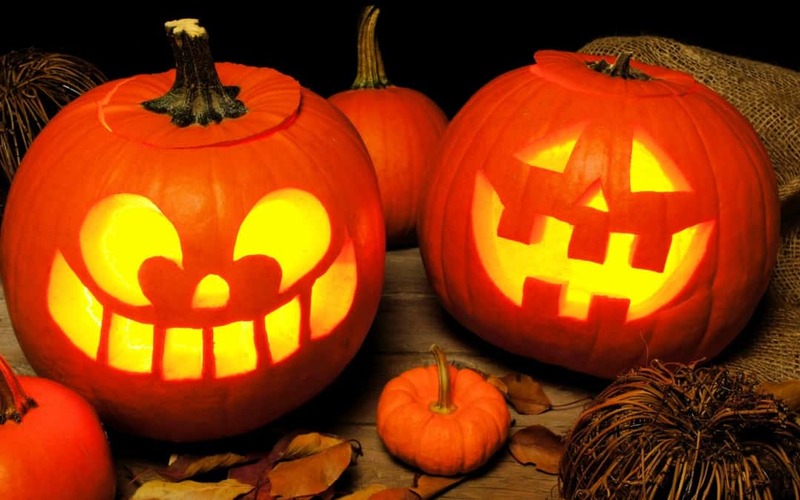 Once it’s time to transform your pumpkins into gruesome, silly or classic jack-o-lanterns be sure to use as much of it as possible. I know it’s slimy and gushy but the pumpkin guts are great! Seeds can be roasted and the pulp can be baked or cooked into lots of goodies! And once you’ve used all you can and when Halloween is over you can compost that pumpkin either in your compost bin or just in your yard but beware…you may end up with a pumpkin vine! Throwing a Halloween party is the best! There are so many fun and frightening activities to do! Here are a few from our party last year – and how we made them green. You get the idea – just take any activity or refreshments you serve and go for a greener version! It’s really easy to do and will keep a lot out of the landfill and save you money! I wish I could report that there was a way to recycle all of those wrappers. I searched and searched for an option with no luck. The closest thing I found was a now closed collection program. 🙁 I also wish I could recommend handing out homemade baked goods but you can guess how that would go over. I did, however, come up with a few other options that may just take the (vampire) bite out of tossing all of those wrappers in the trash! Speaking of teeth falling out, you could save a few teeth and not hand candy out at all and hide in your basement with all the lights out! Just kidding, of course! You could hand out items like cute stickers, glow sticks or plastic vampire teeth but in my book that’s a lot of plastic trash just waiting to get dumped into a landfill. I know, I’m a party pooper!! Another option if you are crafty (and have some free time – ha!) is to save all of those candy wrappers and make some pretty cool stuff out of them. Pinterest is full of ideas ranging from jewelry to purses which would actually make some nice, hand-made gifts! Lastly, even though it still produces a lot of trash, you could opt for sustainably produced candy. This could mean the candy maker gets it’s ingredients from local farms or uses only sustainably produced cocoa for use in chocolate candy – my fav! This doesn’t mean that you have to give up handing out popular chocolates (Hershey’s Kisses, Reese’s peanut butter cups, Twix or Three Musketees) and hand out some organic brand you and your trick or treaters have never heard of or tasted. You can read more about each company’s plans – click here for Mars and here for Hershey. 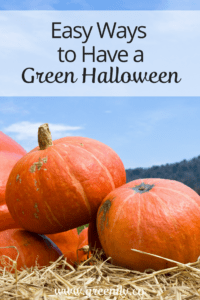 So, as you find yourself surrounded by orange and black everywhere you look during the Halloween season, don’t forget to make sure there is at least a little bit of green in there too and have a green Halloween! I think we do need to think more about how we handle the holidays and do it in a more “green” and sustainable way. Good tips!